"Spanning the 20th century, the story of Roses takes place in a small East Texas town against the backdrop of the powerful timber and cotton industries, industries controlled by the scions of the town's founding families. Cotton tycoon Mary Toliver and timber magnate Percy Warwick should have married but unwisely did not, and now must deal with the deceit, secrets, and tragedies of their choice and the loss of what might have been--not just for themselves but for their children, and children's children." The title "Roses", by Leila Meacham, originates from the symbolism of the heritage of the founding families of the fictional town of Howbukter, Texas. Descendants from England's white rose of York and the red rose of the house of Lancaster, were young men immigrated from South Carolina to Texas in the 1800's. Taking with them from New Orleans was Henri DuMont. Thus begins the town of Howbukter, and Mary Toliver, a descendant from one of these founding families, widow to Ollie DuMont, is age 85 and dying.. many many years later as our novel begins. She worked her whole life on the plantation of Somerset, and poured her blood, sweat and tears into it. So why, after all of this back breaking and sacrificial work so her great-niece can carry on the tradition, why does Mary decide to throw it all away with a puzzling codicil to her will? The novel's point of view changes from Mary, to her niece Rachel, and jumps back and forth in time as the reader begins to put together the puzzle that forms Mary's reasons for wanting the plantation of Somerset to finally be taken out of the Toliver's hands. After generations of work and production on the cotton farm, it is a decision that stuns the family and causes serious rifts between the surviving family members and friends. There are secrets about Mary's past and the other families, and the climax comes when Rachel is forced to discover the truth behind Mary's final decisions which threatens to tear asunder all bonds that have formed after years of friendship, especially between the Warwick family. Percy and Mary have secrets and a hidden love that doesn't come out to the family members until after Mary dies. Before we even get to that point, we are treated to the tears and triumphs of Mary Toliver's life, her romances, marriage, her child, and her friends. But first and foremost, there was Somerset. The one thing that everyone knew that defined Mary Toliver was one word: "Somerset", dismissing the love that Percy held for her. And that is what Rachel had groomed herself to emulate, yet Mary at age 85 changes her mind about leaving the land to Rachel and dies before she has a chance to explain about the Toliver Curse. Focusing on Mary's life, using flashbacks taking us from 1985 to the roaring twenties and further, the story blends the lives of the three original families that founded Howbukter: The Dumonts, Tolivers, and the Warwicks. Each family focused their businesses on different areas but were still close through the many years as their families grew. This novel features everything you could want in a good historical saga; from broken hearts to death and rebirth and faith in humanity, and there were plenty of roses in this story. The rose was now symbolic of friendship and forgiveness between the families, and the theme was dominant throughout the story. I was swept away to another time, to a time where the car was called a horseless carriage, and where women were bred to run a houseful of servants. There were men going off to war, some men going more than once.. some men sending their boys to war and it was so sad to think of my ancestors and our heritage, the way the author portrayed the hopelessness for the families as they watched the boys come and go.. those that returned were broken, those that didn't return broke their families. And this was the reality of America back then, and yet, this is still the reality of today. As the author trapped me into this story I began to feel caught up within the family saga of it all as if it were my own family. I sobbed throughout the chapters as I plodded through, I still needed to know more. But it wasn't the fact of slowly becoming familiar with the story as it slowly touched my heart. That's not the case at all. My heart was gripped at page ten, as I was tearing up already. I cried at several points in the book. I am not going to tell you where.. or who or what.. because you just need to get this book and see for yourself. We are knee deep in the story at page 15. The history, the blend of humanity, the description of the changes of society as Mary witnessed it in her hometown, everything is a perfect blend of a family saga that haunts your soul, sets it on fire, blows it out, and does it all over again. There is love and passion, sorrow and grief all in the American pursuit of happiness. After the page flipping frenzy that the novel absorbed me in, I was a bit underwhelmed at the ending, but it could have just been the disappointment that I had finished it. But it wasn't fireworks and rainbows like I think the author wanted it to be, though I still obviously enjoyed the journey that Leila Meacham took me on. I also loved the fact that the story is set in Texas, probably pretty darn close to my home at that. My town subsisted on cotton farming and its beginnings mirror that of what Leila describes for her town of Howbukter. All in all, this novel was the epitome of an epic family saga that is unforgettable; the emotions that you go through reading it will cause this book to be engraved in your memory. The crazy thing about it all is that this author, Leila Meacham, is a retired school teacher and this is her debut historical novel. She has dabbled in the writing business in eighties with a few obscure romances. I anxiously await her next novel and her next and her next... no pressure, Leila!! Already compared to epic sagas such as Gone With the Wind and The Thorn Birds, this is definitely going to be an author to watch. 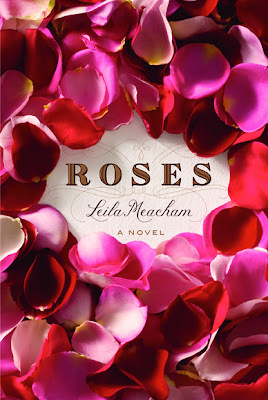 If you enjoy the sweeping style of these sagas, you will definitely enjoy the story of Roses. I also must mention that the packaging of the hardcover was a sight to behold.. the inside covers are also bedecked in vines of roses which was a beautiful touch. This one is a keeper and I can't wait to have Leila sign mine! Meet Leila 2/10/2010 at Legacy Books in Plano, TX!